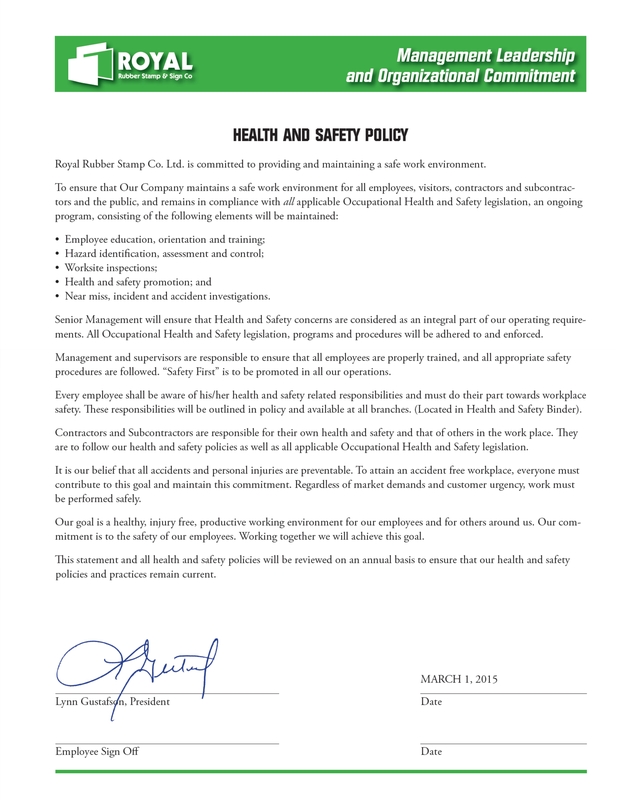 Royal Stamp Blog | Edmonton Royal Rubber Stamp Co.
No Edmonton employer should overlook the importance of having proper safety signs up in the workplace. If you have control over a premises, a worksite, or operating equipment, then it is up to you to mitigate the risks faced by employees and others who may be visiting the area by providing safety signs from the Edmonton custom signage experts at Royal Rubber Stamp & Sign Co.
Site and safety signs, which are intended to provide clear instructions about safety and health, should be used in any instance where other measures do not already provide an effective method for reducing a risk. For example, any safety equipment that is needed to enter the premises should be clearly and thoroughly noted on a site sign in such a way that no one passing by would be able to miss it. This is especially important if employees or other site visitors are not always going to have to pass through any sort of inspection point and checked for the proper safety equipment. A safety sign is intended to identify any hazards in the area and provide information about control measures that have been put in place and need to be followed accordingly. Safety signs deal with any residual risk that hasn't already been mitigated through training and verbal instructions and warnings. It is important to note that safety signs should not be used as a substitute for other methods of risk control. For example, a workplace which has hazards that may cause foot injury should provide signs about the need for foot protection on top of taking other measures to mitigate injury as much as possible. Employees should also be made aware of safety signs and instructed as to their meanings. Many signs are indeed self-explanatory, but it is never advisable to assume that everyone, especially new and inexperienced workers, will take note of and fully understand the message. Information about the safety signs used on site should be a critical part of every employee's training period. Finally, safety signs should always be maintained so that their messages and instructions are clear and legible. If your signs are in an area where they tend to get dirty and obscured, then you should make it a habit to check and clean them as often as need be. High-quality and professionally made signs will be much easier to maintain then low-quality ones. If you're looking for high-quality site and safety signs in Edmonton, then Royal Rubber Stamp is here to help. Our team is committed to providing you with the tools you need to create a safe and efficient work environment that mitigates and prevents against foreseeable risks. You can download our stock safety signs layouts or request a quote from Royal Rubber Stamp either online or by phone today, and we'll get back to you as soon as possible with our competitively priced site signage solutions. Posted on March 31, 2016 - 8:42am by John Smith. Royal Rubber Stamp & Sign Co. is proud to announce that as of July 2015, it is a COR certified company. Royal Rubber Stamp is committed to providing and maintaining a safe work environment for all employees, visitors, contractors and subcontractors. A Certificate of Recognition (COR) is awarded to employers who develop health and safety programs that meet established standards. A COR shows that the employer’s health and safety management system has been evaluated by a certified auditor and meets provincial standards. These standards are established by Occupational Health and Safety (OH&S). In order to achieve COR certification, a certified auditor determined Royal's health and safety management system met or exceeded standards as set out by Occupational Health and Safety (OH&S). In order to keep COR certification, Royal must continue to improve upon its health and safety management system and achieve a higher score in its next audit. As a customer of Royal, you can ensure all work by Royal employees and sub-contractors will be completed safely and efficiently, using only top of the line equipment and tools. These same principles apply not only to work completed in-house at Royal's 15,000 sq. foot facility, but also when out at job sites. Our installation staff is trained to recognize, document and when possible, eliminate any hazards that could cause a potential worksite accident. This attention to detail keeps both workers and the general public safe and allows for a smooth, hassle-free installation experience. As one of the only COR certified sign shops in Alberta, Royal is a step above the competition. Work completed safely and efficiently by Royal's well-trained staff can save you and your business time and money. If you'd like to know more about our health and safety management system, give us a call at (780) 426-4676 in Edmonton or toll free at 1-800-272-8859. Posted on September 16, 2015 - 12:18pm by Stefan. The highly anticipated new Ideal Seal has arrived. The Ideal Seal was named Product of the Year 2015 by the ISPA in the "Office Items and Supplies" category at Paperworld - the international trade fair for paper, office supplies and stationery products. This new seal will replace our current pocket and small blue desk seals. You can see the seal in action in the video below. The video below shows you how to insert the holder into the body of the seal. Our pricing will remain the same. Current inventory stock of small blue desks are depleted. Pocket seal invetory is low and once our stock runs out we will be using Ideal Seals in place of our pocket seals. Posted on June 2, 2015 - 8:24am by Yung.